Toronto, Ontario--(Newsfile Corp. - January 10, 2019) - IAMGOLD Corporation (TSX: IMG) ("IAMGOLD" or the "Company") today provided a further update from its 2018 drilling program completed at its Nelligan joint venture project (IAMGOLD Corporation: 51%, Vanstar Mining Resources Inc. ("Vanstar"): 49%), located 60 kilometres southwest of Chibougamau, Quebec, Canada. The Company is reporting assay results from the remaining nine (9) diamond drill holes totaling 4,487 metres completed as part of the 2018 drilling program. 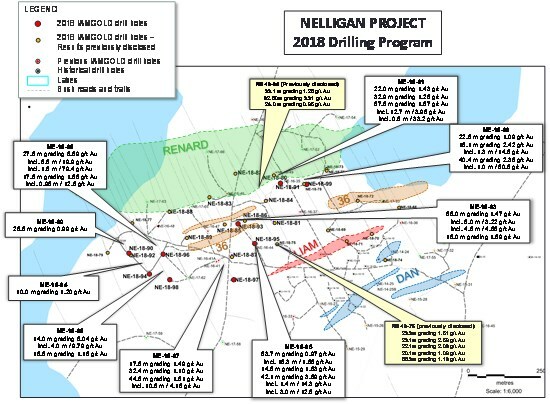 Craig MacDougall, Senior Vice President, Exploration for IAMGOLD, stated: "The 2018 drilling program has delivered encouraging results in all the drill holes completed this year, confirming and extending the wide zones of alteration and associated mineralization identified from previous programs. Four mineralized zones were outlined through the recent drilling campaigns, the most significant to date being the Renard system, and all zones remain open for potential extensions. These results will be used to refine a preliminary deposit model to help guide future drilling campaigns and support the completion of an initial resource estimate planned in the coming months." The sampling of, and assay data from, the drill core is monitored through the implementation of a quality assurance - quality control (QA-QC) program designed to follow industry best practice. Drill core (NQ size) samples are selected by the IAMGOLD geologists and sawn in half with a diamond saw at the project site. Half of the core is retained at the site for reference purposes. Sample intervals may vary from half a metre to one and a half metres in length depending on the geological observations. Samples are transported in sealed bags to ALS Minerals Laboratory ("ALS") located in Val-d'Or, Québec. Samples are coarse crushed to a -10 mesh and then a 1,000 gram split is pulverized to 95% passing -150 mesh. ALS processes analytical pulps directly at their facilities located in Val-d'Or which is ISO / IEC 17025 certified by the Standards Council of Canada. Samples are analyzed using a standard fire assay with a 50 gram charge with an Atomic Absorption (AA) finish. For samples that return assay values over 5.0 grams per tonne, another pulp is taken and fire assayed with a gravimetric finish. Core samples showing visible gold or samples which have returned values greater than 10.0 grams per tonne are re-analyzed by pulp metallic analysis. IAMGOLD inserts blanks and certified reference standards in the sample sequence for quality control. This news release contains forward-looking statements. All statements, other than of historical fact, that address activities, events or developments that the Company believes, expects or anticipates will or may occur in the future (including, without limitation, statements regarding expected, estimated or planned gold production, cash costs, margin expansion, capital expenditures and exploration expenditures and statements regarding the estimation of mineral resources, exploration results, potential mineralization, potential mineral resources and mineral reserves) are forward-looking statements. Forward-looking statements are generally identifiable by use of the words "will", "should", "continue", "expect", "anticipate", "estimate", "believe", "intend", "to earn", "to have', "plan" or "project" or the negative of these words or other variations on these words or comparable terminology. Forward-looking statements are subject to a number of risks and uncertainties, many of which are beyond the Company's ability to control or predict, that may cause the actual results of the Company to differ materially from those discussed in the forward-looking statements. Factors that could cause actual results or events to differ materially from current expectations include, among other things, without limitation, failure to meet expected, estimated or planned gold production, cash costs, margin expansion, capital expenditures and exploration expenditures and failure to establish estimated mineral resources, the possibility that future exploration results will not be consistent with the Company's expectations, changes in world gold markets and other risks disclosed in IAMGOLD's most recent Form 40-F/Annual Information Form on file with the United States Securities and Exchange Commission and Canadian provincial securities regulatory authorities. Any forward-looking statement speaks only as of the date on which it is made and, except as may be required by applicable securities laws, the Company disclaims any intent or obligation to update any forward-looking statement. Si vous désirez obtenir la version française de ce communiqué, veuillez consulter le www.iamgold.com/French/Home/default.aspx. True widths are estimated at 70 to 94% of the core interval. Drill hole intercepts are calculated with a lower cut of 0.50 g/t Au and may contain lower grade interval of up to 5 metres in length. They are generally reported with a minimum g*m (or Metal factor) of 5. 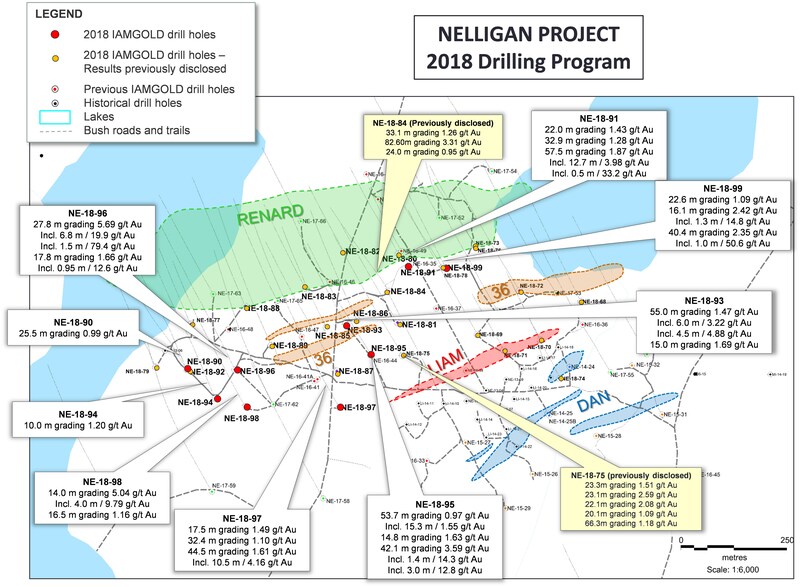 Figure 1: Nelligan drill hole plan map and highlighted 2018 assay results.